Holy Family – Holy Name is a Nominee for the ‘2019 Best of the Best Awards’! The nominations are in and only the top businesses in each category made it to the final voting stage. It’s now time to place your votes to determine who the winners will be. Votes can be placed between April 8th and April 26th. You can vote EVERY day! 1. Simply click on the “Vote Now” button below. 2. Scroll to the bottom of the page to find the “Pre-school” and “Private School” categories. 3. Place your vote for HFHN School and fill in your email address. Continue and complete the registration form. (You MUST register to vote). 4. 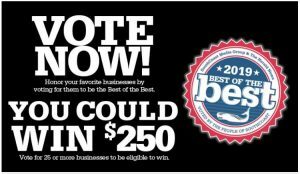 Please remember to vote for HFHN in each category. Please share this with your family and friends! Thank you!